Bed Bug Dogs Available in Savannah, Statesboro, St. Simons, Hilton Head for Inspections. They can find Bed Bugs even when they are inaccessible to visual inspection. Here is a link to a video of one of the dogs (Aaron) with a GoPro Camera on his back doing a training exercise. The Dogs enjoy working every day. They can distinguish between bed bugs and other insects very easily. They know the difference just like we know red and blue. As humans we think in terms of vision because that is our main sense. “You should see what I saw yesterday”. “I saw it that way.” ” See what you can do about it”. These dogs are like little biological x-ray machines that are portable and have great personalities. They help us to quickly determine which areas are infested and which are not, making remediation much more accurate and thorough. The dogs are paired with a handler and trained to work daily with their “Best Friend” This handler is responsible for their every whim. Feeding, Grooming, Training constantly, Safety. But most of all there is a bond that develops that makes the dog want to please their handler. Yes they are rewarded for finding them just as we are rewarded for work. It is like a fun game for the dogs and they are proud of their finds. We have many customers that find them fun to watch. We do many High-Rise, Assisted Living, Hotels where the dogs can inspect a room in just a few minutes with accuracy. Its not uncommon for them to complete 40-60 units a day. Heat is a factor as we must keep the dogs cool. We are very mindful of the animals safety and living conditions. The handlers always fall in love with their dogs. This is because they watch the dogs perform so well and realize that they are solely working to please them. It is only natural to immensely love them also. It is not uncommon for a dog to follow their handler everywhere they go. They usually don’t want their handler out of sight. So they tag along everywhere, just being a regular dog when off-duty. After the K9 does their job we are making notes to help us do a great job of elimination. We use Thermal Remediation Heat Equipment to eliminate bed bugs. Bed Bugs have no resistance to temperatures above 118 degrees. We use electric equipment (No Propane) and create our own power with installed generators in our trailers or trucks. It is typical for a Heat Treatment to take 5-7 hours to complete. There is some preparation that needs to take place by the resident. If you have a bed bug issue or you think you may have a problem and want the K9 service to be sure give us a call at 770-957-1915 and we will get the ball rolling to get you bed bug free and keep it that way. 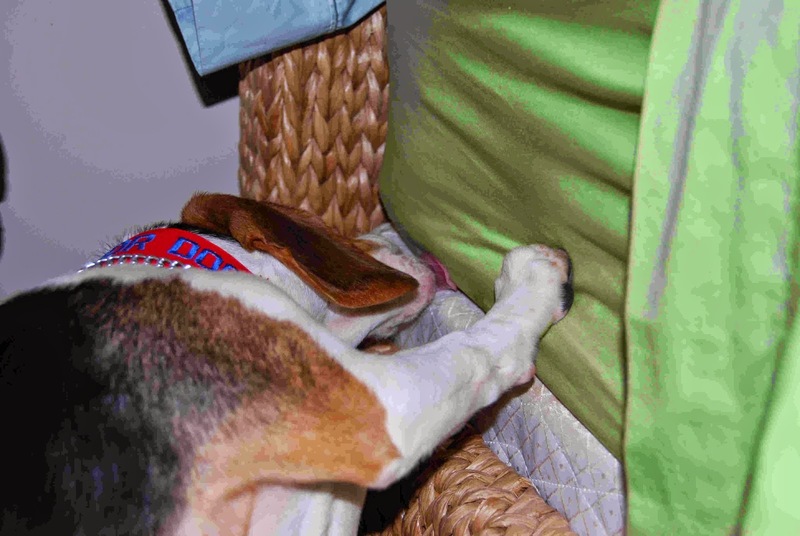 The Truth About Bed Bug Dogs and Their Usefulness ! Many of you may have seen the 20/20 story Friday night on Bed Bug Dogs. If you did not see it here is the link. I knew this would happen sooner or later. I am actually surprised it took so long. Why do I say that ? Anytime there is a scenario where consumers know little about a subject there will always be someone that will take advantage of this. Did the Handlers know their dog was giving them a False Positive ? What Happened Here ? It is apparent to me from watching the dogs working that the Handler is either not doing his job properly due to laziness, lack of training, or unscrupulous inclination. Here is the Deal: The Dogs are trained to a particular Scent or Insect.. They discriminate between that stimulus and all others. With Bed Bugs in particular,they are very difficult to work with due to the paranoia of them releasing into the work area. (Very Understandable) Therefore they must be placed in containers or vials. When they are placed in vials there is a screen covering the top that also is usually taped. When working with these vials the dog is rewarded for responding to these different stimuli. In other words the dogs smells the vial,screen,tape and anything inside the .vial and is rewarded . Most of these dogs are bought from trainers, and the handlers are given very little training on how to properly Calibrate their dog to keep them sharp and on target. For instance I noticed on the video one of the handlers rewarded both dogs for a False Positive Response. How Long has this been going on ? The Dog is saying “Sucker” to his handler. This is a situation where the handler has lost control and the dog is running the show. Is it because of lack of training or because it is financially rewarding ? Maybe a little of both. Was it the trainers fault. Yes ,in a way. He should not have sold the dog without the handler getting the proper training which should include an ongoing system of Exercises that must be done continually for the dog to perform. The Trainer knows the handler will not be successful without ongoing training.Who is monitoring the handler ? Usually the company will purchase a dog which includes some very basic initial handler training. When they leave the training site in most cases the dogs are performing very well. The handlers however with their training do not understand what it takes to have a top performer dog. Are they doing at least 3-4 Calibrations every week mixing in dead bugs,empty vials, tape,other insects etc. ? Are they providing exercises where the problem is found in hard to get to areas ? Are they hiding their own problems and their dog is honing in on the handlers scent ? Do they know to rub down areas and try to get a response from their dog in exercises. ? In too many cases NO. I started handling dogs to find termites in the 80’s. The company I worked for had their own certification program due to the 1 million dollar insurance policy we had that covered the decision. We had a quarterly program where trainers would come and visit for a few days. These guys were tough and made sure I did everything I was supposed to do as a handler. If I had skipped a few exercises it would show up quickly and I knew it. Like the trainer says ‘ You may tell me you are doing your exercises but the dog doesn’t lie. They could run some exercises and quickly tell if you have been doing your job. They would not leave until we had any problems straightened out. This made me a much better handler. I can not imagine what would have happened without these visits. Of course the cost of the Trainers doing their recertification every quarter was somewhat expensive. You are talking about an airline ticket, hotel, and food for 2-3 days every quarter. The 4 dogs that gave false positive responses could be straightened out but it would take 2-3 weeks on intense exercises to accomplish this. This is handler error. But somebody should have caught this long ago. I also believe that Bed Bug Dogs can be a very helpful tool if used properly. My recommendation is if you are going to use the services of a dog you should require confirmation. If there is confirmation then Certification programs are not important. There are a few Yearly Certification programs which is better than none but are they acceptable ? No not to me they are not. I have seen too many cases where a handler team can be working horribly within a few weeks of certification and now we are going 10-11 more months ? Also if you see the dog go straight to the kitchen and start looking for food that is not a good sign. Don’t worry about voice signals. I control my dog with my voice but I will not induce a response simply with my voice. It also is not important how the dog is rewarded. Every dog is different and food rewards are fine as long as they are Calibrated correctly. We use the dog every day to help US find Bed Bugs. If the dog alerts I should be able to find some type of evidence in the area. Because Bed Bugs move, sometimes the dog will be smelling the scent of the bug that was there a couple of hours ago and has moved to another area. If my dog responds to an area he is almost always right. But I check the area and if we do not find any evidence we recommend to continue monitoring. This Lure last for 90 days and is another tool we use to determine where bed bugs are present. We can use this after an initial Sensor Dog Inspection for a continuous quarterly monitoring program. Give us a Call at 770-957-1915 if you have questions or would like to schedule a Bed Bug evaluation. Clark Pest Remedy is the Bed Bug Expert Company in Georgia. Atlanta Georgia has Bed Bugs ! Kill Them With Heat ! How Long Has Atlanta Had a Bed Bug Problem ? Atlanta has had Bed Bug problems for the past 6 years. There may have been some isolated incidences before that but the main influx of infestation started around 2006-2007. Our calls have dramatically risen since then. Some Residential customers are bringing them home from Hotels and Resorts on trips. Others are bringing them in on used furniture or clothing. Visitors that are infested can bring you their problem. Unattached residences are the easiest for us to control simply because it is a more controlled environment. We generally have more cooperation for preparation for treatment. It is also easier to control the traffic in and out to focus on not spreading the bugs. Controlling them in a multi-unit high rise can be very difficult. Educating the tenants is something we do a lot of. I have Tenant Classes I tech to have them be more aware of how they can obtain bed bugs. I show them pictures and explain how they transfer. I warn them not to bring possibly infested items into the building. Also if they have infestation they need to be very careful taking infested Mattresses and Box springs out of the building. If you are having a Bed Bug problem at your home or facility Call Us Today at 770-957-1915 and we will be glad to answer any questions you may have and let us explain our Complete from Start to Finish Bed Bug Program. From Sensor Bed Bug Dogs for Detection to Thermal Remediation Equipment for Excellent Results !